Winnie's Inky Fingers: Congratulations On Your New Alarm Clock! My husband came home and asked if I could make a card for his co-worker friend James. James and his wife had a little baby girl and he wanted a funny card for him. I decided to use my alarm clock stamp from the Stampers Anonymous Blueprint series. The image is heat embossed with Ranger silver embossing powder. The card was distressed using Antique Linen Distress Inks. If you look close enough you may notice a tiny pink safety pin! I thought it would be fun to use computerized "crying" sounds coming from the alarm clock. For the inside I used a fun sentiment from Raisin Boat congratulating the couple on their new alarm clock! I really love Raisin Boat's "Innies & Outies" as the sentiments are perfect for card making and cut to fit the A2 size without trimming, etc. Congratulations to James and Kristin on the birth of their daughter, Charlotte! I love it! 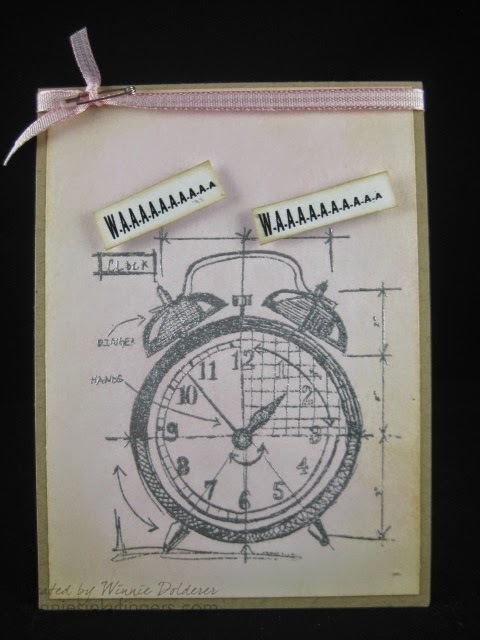 What a clever idea to use a clock as the motif for a new baby card. I also like the elegance that the pink ribbon and dainty safety pin add to the design. I'm sure they'll treasure this card in Charlotte's baby album. Blessings to you and your husband, my friend! Such a cute card. You are so creative. Love the image and the idea.